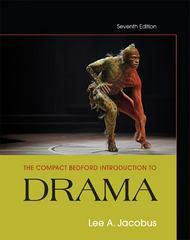 The Compact Bedford Introduction to Drama 7 Edition Offering a carefully chosen selection of plays from the ancient Greeks to the present — including many new contemporary prize-winners — The Compact Bedford Introduction to Drama has the plays you want to teach and the features students need at a compact size and an affordable price. Twenty-eight chronologically arranged plays are illuminated by insightful commentaries and casebooks that enrich students’ contextual understanding and encourage critical thinking. Concise introductions for each historical period and play emphasize theater design, staging, and acting style, and a wealth of photographs and illustrations help students visualize plays in performance. A fresh new design highlights the contextual features and additional help for students including a guide to writing about drama, a glossary, and new cross-references to a robust companion Web site.